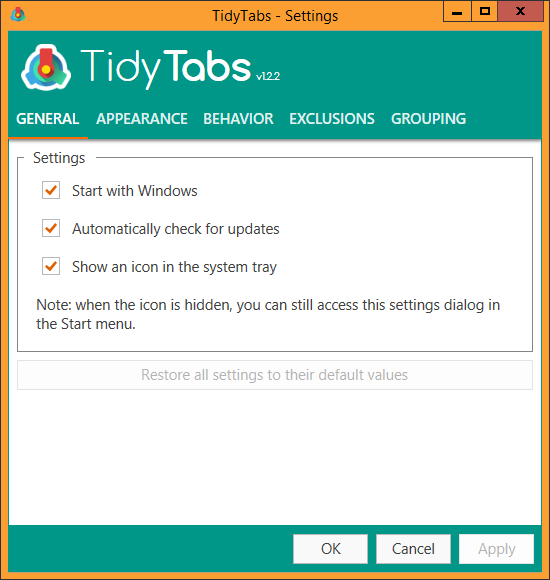 Here you can configure the general settings of TidyTabs. To access this screen, double-click on the tray icon, at the bottom-right corner of the screen. Start with Window: when enabled, TidyTabs will be automatically launched at each Windows startup. The default value is enabled. Automatically check for updates: when enabled, TidyTabs will check once a week on our server if a new version is available. If a new version is available, TidyTabs will offer you to install it. The default value is enabled. Show an icon in the system tray: when enabled, TidyTabs will display an icon in the Windows System Tray, at the bottom right corner of the screen. This icon allows you to quickly access the configuration dialog. When this icon is hidden, you can still access the configuration dialog from the Windows Start menu. The default value is enabled.